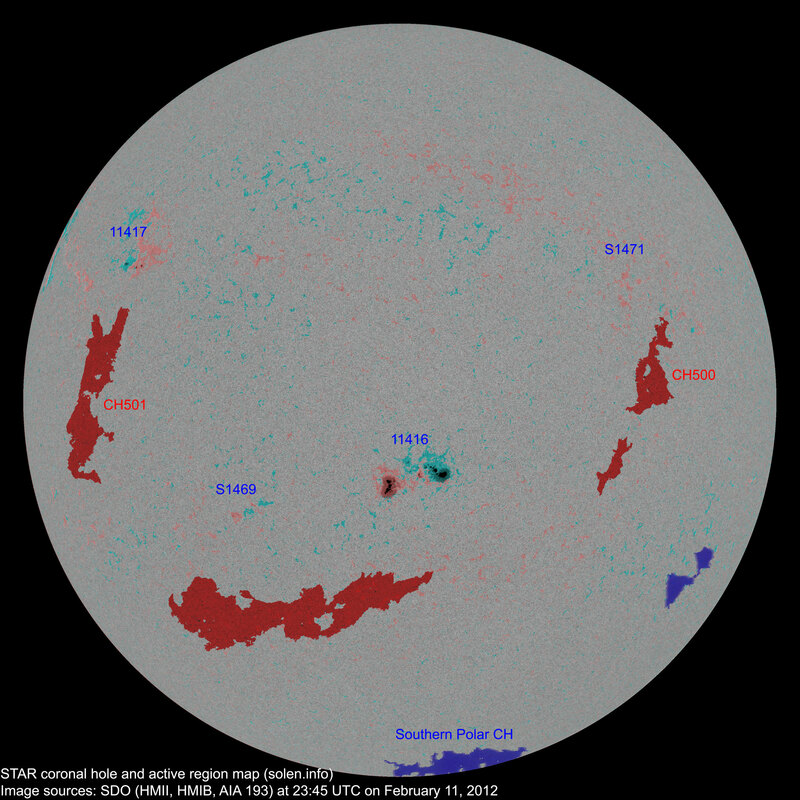 The geomagnetic field was quiet on February 11. Solar wind speed ranged between 322 and 410 km/s. 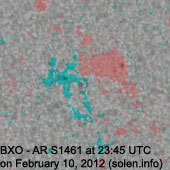 Solar flux measured at 20h UTC on 2.8 GHz was 112.3 (decreasing 21.2 over the last solar rotation). The planetary A index was 4 (STAR Ap - based on the mean of three hour interval ap indices: 3.6). Three hour interval K indices: 21101111 (planetary), 31111211 (Boulder). 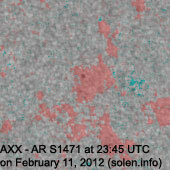 Region 11417 [N17E47] was quiet and stable. 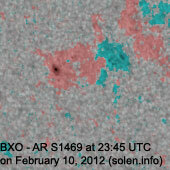 A region just behind the northeast limb was quite active during the day producing many C flares. The leading penumbra is becoming visible at the limb early on February 12. Flares: C1.4 at 08:55, C7.9 at 10:44, C2.7 at 16:05, C7.7 at 18:54, C5.3 at 19:12, C2.7 at 20:44, C2.7 at 23:33 UTC. Minor update posted at 13:25 UTC: Regions S1474 (N28E81 at noon) and S1473 (N11E85 at noon) have rotated into view (see this high resolution map) while the trailing penumbra in region 11416 appears to be splitting into 2 smaller penumbrae. 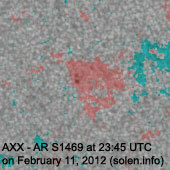 Region S1469 is developing and has added several spots. 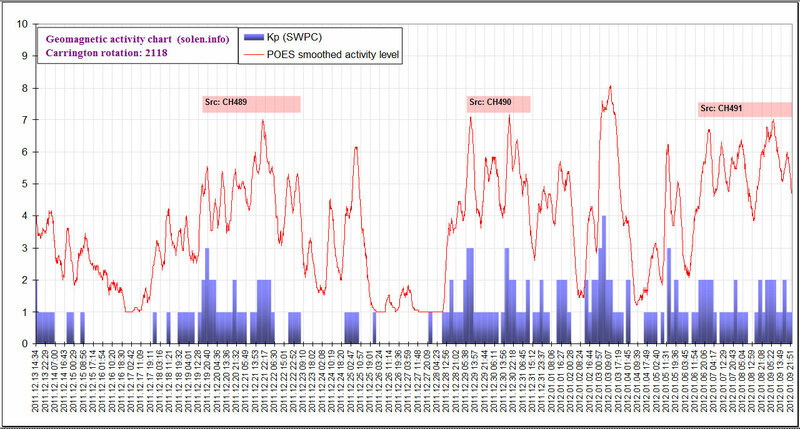 A low speed stream associated with CH500 arrived at ACE near 06h UTC. 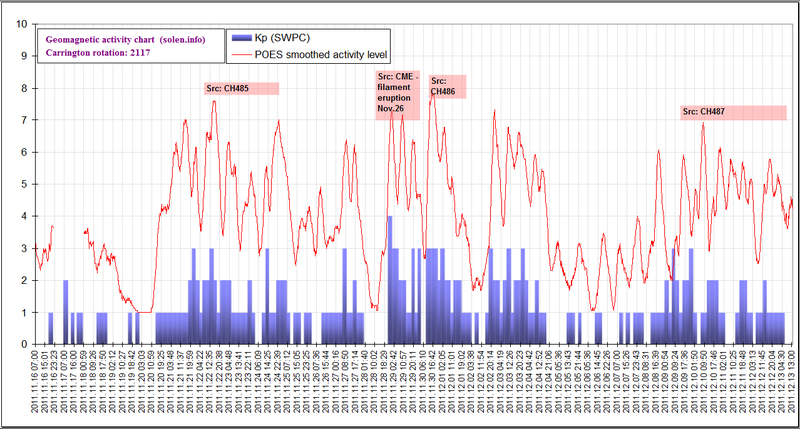 February 10-11: No obviously Earth directed CMEs were observed in LASCO and STEREO imagery. 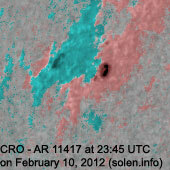 February 9: A filament eruption near region 11417 late in the day produced a large partial halo CME with nearly all material observed off the east limb. There were faint traces of ejecta over parts of the northwest limb. 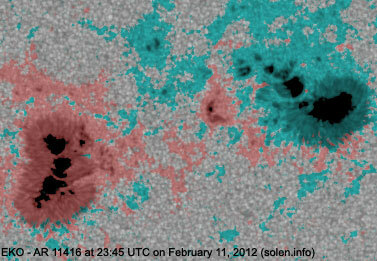 While the core of the CME will not reach Earth there's a chance of a weak flanking impact on February 12 or 13. 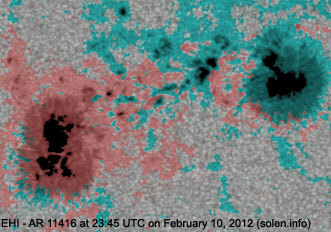 A recurrent trans equatorial coronal hole (CH500) was Earth facing on February 8-9. 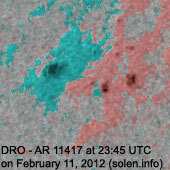 A trans equatorial coronal hole (CH501) will likely rotate into an Earth facing position on February 15-16. 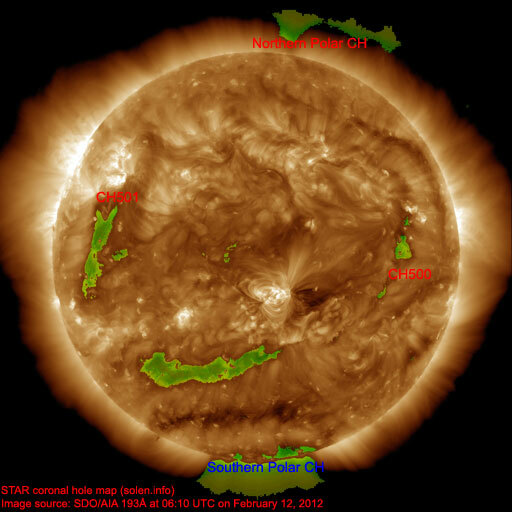 The geomagnetic field is expected to be quiet to unsettled on February 12 due to weak coronal hole effects. 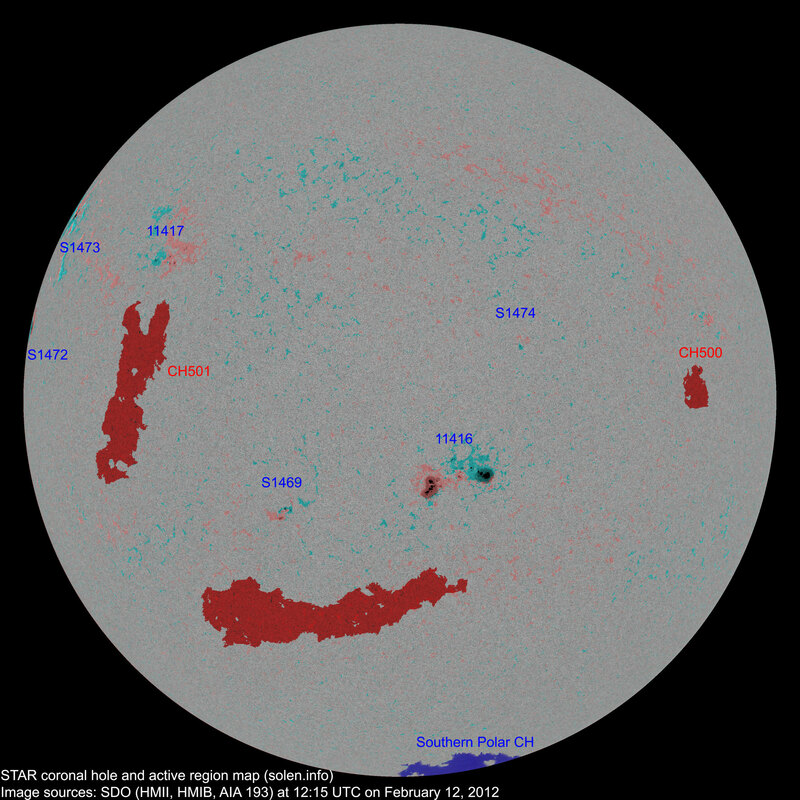 Quiet conditions are likely on February 13-14, with a chance of a few unsettled intervals due to a possible flank CME impact.